^ 第一次から第四次までそれぞれフィリップ王戦争、ウィリアム王戦争、アン女王戦争、ラル神父戦争。出典：Taylor, Alan. Writing Early American History. Philadelphia: University of Pennsylvania Press, 2005; pg. 74. ^ William Williamson. The history of the state of Maine. Vol. 2. 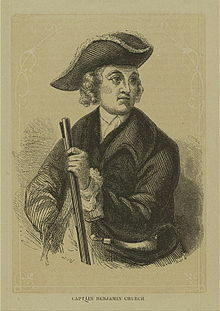 1832. p. 27; Griffiths, E. From Migrant to Acadian. McGill-Queen's University Press. 2005. p.61; Campbell, Gary. The Road to Canada: The Grand Communications Route from Saint John to Quebec. Goose Lane Editions and The New Brunswick Heritage Military Project. 2005. p. 21. Arnade, Charles W (1962). “The English Invasion of Spanish Florida, 1700–1706”. The Florida Historical Quarterly 41 (1, July): 29–37. JSTOR 30139893.
Cooper, William James; Terill, Tom E (1999). The American South: A History, Volume 1. Lanham, MD: Rowman and Littlefield. ISBN 9780742560949. OCLC 227328018. Covington, James (1968). “Migration of the Seminoles into Florida, 1700–1820”. The Florida Historical Quarterly 46 (4, April): 340–357. JSTOR 30147280. Crane, Verner W (1919). “The Southern Frontier in Queen Anne's War”. The American Historical Review 24 (3, April): 379–395. JSTOR 1835775. Drake, Samuel Adams (1910) . The Border Wars of New England. New York: C. Scribner's Sons. OCLC 2358736. http://books.google.com/books?id=L_AXAAAAIAAJ&dq=drake+border+wars. Eccles, William J (1983). The Canadian Frontier, 1534–1760. Albuquerque, NM: UNM Press. ISBN 9780826307064. OCLC 239773206. Griffiths, Naomi Elizabeth Saundaus (2005). 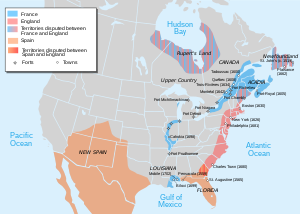 From Migrant to Acadian: a North American Border People, 1604–1755. Montreal: McGill-Queen's University Press. ISBN 9780773526990. OCLC 180773040. Higginbotham, Jay (1991) . Old Mobile: Fort Louis de la Louisiane, 1702–1711. Tuscaloosa, AL: University of Alabama Press. ISBN 9780817305284. OCLC 22732070. Leckie, Robert (1999). A Few Acres of Snow: the Saga of the French and Indian Wars. New York: John Wiley. ISBN 9780471246909. OCLC 39739622. MacVicar, William (1897). A Short History of Annapolis Royal: the Port Royal of the French, From its Settlement in 1604 to the Withdrawal of the British Troops in 1854. Toronto: Copp, Clark. OCLC 6408962. http://books.google.com/books?id=l8cOAAAAYAAJ&printsec=frontcover&cad=0. Marshall, Bill; Johnston, Christina (2005). France and the Americas: Culture, Politics, and History. Oxford: ABC-Clio. ISBN 9781851094110. OCLC 264795152. Newman, Peter C (1985). Company of Adventurers: The Story of the Hudson's Bay Company. Markham, ON: Viking. ISBN 0670803790. OCLC 12818660. Oatis, Steven J (2004). A Colonial Complex: South Carolina's Frontiers in the Era of the Yamasee War, 1680–1730. Lincoln, NB: University of Nebraska Press. ISBN 9780803235755. OCLC 470278803. http://books.google.com/books?id=_rcFu4KjwVAC&lpg=PA42&dq=%22Queen%20Anne's%20War%22%20Carolina&pg=PA42#v=onepage&q=%22Queen%20Anne's%20War%22%20Carolina&f=false. Parkman, Francis (1892). A Half-Century of Conflict, Volume 1. Boston: Little, Brown. OCLC 767873. http://books.google.com/books?id=mbPhAAAAMAAJ. Parkman, Francis (1897). Montcalm and Wolfe: France and England in North America, Volume 1. Boston: Little, Brown. OCLC 7850560. http://books.google.com/books?id=Oo6bhxmlCmMC&printsec=frontcover&cad=0. Plank, Geoffrey (2001). An Unsettled Conquest. Philadelphia: University of Pennsylvania Press. ISBN 9780812218695. OCLC 424128960. Pope, Peter Edward (2004). Fish Into Wine: The Newfoundland Plantation in the Seventeenth Century. Chapel Hill, NC: University of North Carolina Press. ISBN 9780807829103. OCLC 470480894. Prowse, Daniel Woodley (1896). A History of Newfoundland: from the English, Colonial, and Foreign Records. London: Eyre and Spottiswoode. OCLC 3720917. http://books.google.com/books?id=jdEOAAAAYAAJ&dq=newfoundland%20raid%201705&pg=PA242#v=onepage&q=Moody&f=false. Rodger, N. A. M (2005). The Command of the Ocean: a Naval History of Britain, 1649–1815, Volume 2. W. W. Norton. ISBN 9780393060508. OCLC 186575899. Shurtleff, Nathaniel Bradstreet (1871). A Topographical and Historical Description of Boston. Boston: Boston City Council. OCLC 4422090. http://books.google.com/books?id=UWkUAAAAYAAJ. Stone, Norman (ed) (1989). The Times Atlas of World History (Third ed.). Maplewood, NJ: Hammond. pp. 161, 165. ISBN 0723003041. Thomas, Alan Clapp (1913). A History of England. Boston: D. C. Heath. OCLC 9287320. http://books.google.com/books?id=cr8XAAAAIAAJ&printsec=frontcover. Waselkov, Gregory A; Hatley, M. Thomas (2006). Powhatan's Mantle: Indians in the Colonial Southeast. University of Nebraska Press. ISBN 9780803298613. OCLC 266703190. Weber, David (1992). The Spanish Frontier in North America. New Haven: Yale University Press. ISBN 9780300059175. Winsor, Justin (1887). Narrative and Critical History of America, Volume 5. Boston: Houghton Mifflin. OCLC 3523208. http://books.google.com/books?id=3pMLAAAAIAAJ&dq=Moore%201702%20Augustine&pg=PA318#v=onepage&q=Moore%201702%20Augustine&f=false. Wright, J. Leitch, Jr (1971). Anglo-Spanish Rivalry in North America. Athens, GA: University of Georgia Press. ISBN 9780820303055. OCLC 213106.